Television expresses American identity in profound and influential ways. From news to cartoons, sitcoms to drama, programs have reflected the issues and values—if not always the realities—of the eras that produced them. As a source of information, ideas, and shared experiences, television has also shaped how we understand the present and remember the past. 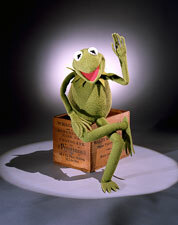 The creation and alter ego of master puppeteer Jim Henson, Kermit the Frog is an American icon, recognized worldwide as the television star of Sesame Street and The Muppet Show. 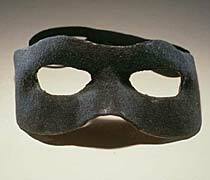 Clayton Moore wore this black mask as the star of The Lone Ranger (ABC, 1949–57), a Western about a Texas Ranger who disguises his identity to fight crime on the frontier. Social conflicts of the day played out in the Bunkers’ living room as the bigoted Archie clashed with his liberal son-in-law and his wife Edith struggled to keep the peace. 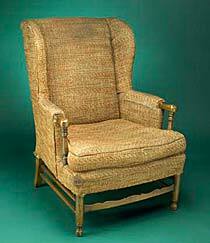 With sharp but affectionate humor, the show exposed the flaws and complexities of one American family. 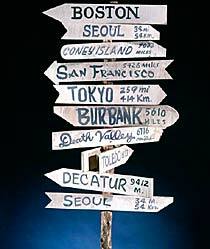 Pointing the way to anyplace but here, this prop from M*A*S*H (CBS, 1972–83) reflects the characters’ humorous efforts to cope with the horrors of war. 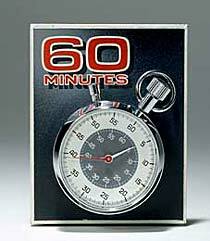 The most-watched news program in American history, 60 Minutes (CBS, 1968– ) revolutionized television journalism with its pioneering newsmagazine format. As conceived by producer Don Hewitt, the show includes a mix of breaking news, investigative reports, interviews, and commentary. The famous opening logo, a ticking stopwatch, also marks time between segments. This watch was used on the program until the late 1990s, when it was replaced by a computer graphic. Actor LeVar Burton wore these prop manacles in the miniseries Roots (ABC, 1977), a dramatic portrayal of slavery as experienced by several generations of one family. Based on Alex Haley’s autobiographical novel, Roots began with Kunta Kinte, an African youth brought to America as a slave in the 1700s, and ended with the emancipation of his descendants during the Civil War. Watched by more than 100 million people, it was a significant departure from programs that had traditionally relegated blacks to minor, stereotyped roles.